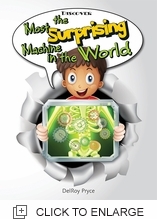 This book invites all children to make a fascinating journey to explore inside the worldï¿½s most amazing machine. It teaches that human beings are the result of a well-thought-out design by an Intelligent Beingï¿½the Creator of the universe and not of chance. It has different and engaging activities.